Am I crazy in thinking Zi-O Trinity looks far better than Grand Zi-O? It really all depends on whether you find being covered in gold statues ridiculous in a charming or unpleasant way. So Zi-O Trinity is Zi-O's Climax Form and Grand Zi-O is Zi-O's King Form/Grateful Damashii pretty much. 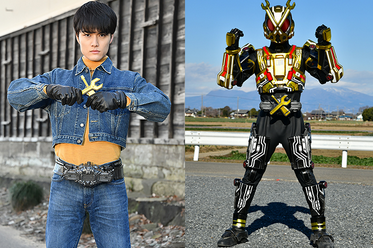 Zi-O Trinity is alright, love the CMYK color palette they got going(Cyan for Woz, Magenta for Zi-O, Yellow for Geiz, and then the suit's base color being Black). Also like how the watch strap part on the helmet reminds me of Kamen Rider ZO a bit. I think it will look better in live-action as most of these tend to do so looking forward to it. Grand Zi-O looks great and a nice nod to Blade King From mostly and also a bit of Ghost Grateful Damashii. Also, judging by how Kuuga, Kiva, Decade, W, OOO, Fourze, Ex-Aid, Build, and Zi-O is positioned on the flyer scan, I guess the heisei rider engravings on the armor will most likely be in this order. Last edited by Sunred; 02-08-2019 at 09:45 PM..
Just stumbled across this. So we basically have Kamen Rider Kikaider. Also so much denim, I love it. Last edited by BlueSaint; 02-09-2019 at 08:09 PM..
Kamen Rider Kikai is Rento Makina. He... loves to cosplay as Jiro from Kikaider because trivia. For those still wondering who the actor is, he was the ice-eating gangler Zamigo in LvsP. 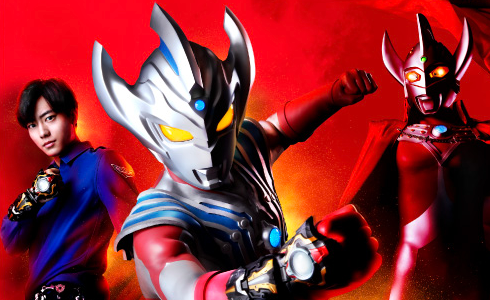 Last edited by Sunred; 02-09-2019 at 09:47 PM..
Now I want a secondary Rider called Kamen Rider Hakai. Last edited by gashatfreak; 02-09-2019 at 11:08 PM..
What I found funny since you brought up the Hakai bit is that Kikai's color scheme to an extent is close to Hakaider's with the primary black and yellow/gold parts with bits of red. But mostly feels a lot like Gold Drive. The full suit actually looks amazing for just being a repaint with a new helmet, really wish we got this as the design for the Guardians in Build. Looks like a rejected Build design. The suit is a modified Guardians suit after all. Zi-O Grand is so silly but it works.